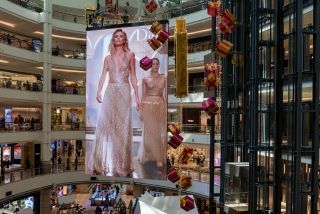 The Suria KLCC Shoping Mall in Kuala Lumur, Malaysia recently installed the world’s largest double-sided LED display from NanoLumens. Bigger, brighter, and blending better into their environments, today’s video walls are transforming the way we look at everything from entertainment to critical data. Of course, video walls are nothing new; they have been around for several decades, and for the most part, in two basic form factors. For spaces like control rooms, you had multiple bulky monitors stacked together. And for a select few locations—like scoreboards at the biggest stadiums and advertising spaces in the highest traffic areas like Times Square—early CRT-based, large-screen video boards gave a glimpse of the future, albeit at sub-VGA resolutions and extremely hefty price tags. As time passed, tube TVs gave way to LCD panels for multi-monitor video walls, and LED technology expanded the possibilities of seamless, expansive walls. Today, the bezels of the former have become so miniscule, and the pixel pitches of the latter so fine, that both form factors have converged on the ideal experience: a pure, unencumbered expanse of digital video. For example, the Suria KLCC Shoping Mall in Kuala Lumur, Malaysia recently installed the world’s largest double-sided LED display, according to NanoLumens. Hanging in its center court area, the 19-foot-wide by 33-foothigh Performance Series 4.7mm double-sided display rotates, showcasing many of the mall’s upscale consumer brands. tvONE video processors like the CORIOmaster family provide high-quality format conversion, scaling, and dynamic window transitions to power impressive video walls. When it comes to more detail-intensive uses, the video wall category has been dominated by grids of LCD panels for the past couple decades due to their advantage in resolution over LED. However, the competitive balance is shifting quickly in favor of the latter technology. “Advancements in performance—which include higher pixel pitch, expanded color gamut, higher refresh rates, lighter weight mechanics, intuitive user interface, and ease of installation and serviceability—coupled with major refinements in manufacturing and global component sourcing make LED products of today attainable to more markets than ever before,” said Paul Johnston, CTS, vice president of technical services operations at Absen. Absen’s A27 series comes in varying models to accommodate use cases ranging from digital signage displays in transportation centers to presentation screens in meeting rooms. Absen only makes direct-view LED displays, and has a range of solutions for a variety of applications, from outdoors to meeting rooms. “Absen continues to push the envelope on new emerging technologies such as IMD, Macro, and Micro LED,” Johnston said. “As the convergence of technology meets the performance and price point requirements, Absen introduces these emerging technologies into our portfolio.” An example of the company’s flexibility is its A27 series, which comes in varying models to accommodate use cases ranging from digital signage displays in transportation centers to presentation screens in meeting rooms. As LED marches forward, manufacturers of LCD video walls are innovating with equal fervor. One company that is pushing this category to the limit is Barco, which launched its UniSee video wall line in 2017. Touted by the company as “bezelless,” these 55-inch LCD panels have a mere 1.09-millimeter gap between the display units. But, the slimness of these walls’ seams is just one selling point. Touted by the company as “bezel-less,” Barco UniSee’s 55-inch LCD panels have a mere 1.09-millimeter gap between the display units. The “View” tenet refers to the narrowness of the seams, as well as improvements in inter-tile uniformity, brightness, and reliability. “Mount” is—you guessed it—the line’s mounting structure, which is designed to ensure and maintain precise alignment, while also allowing for easier diagnostics and service. Lastly, UniSee Connect software allows for the control and management of the wall “as if it would be one single screen,” according to Schoels. With a plethora of choices, what factors should organizations consider when looking to install or upgrade their video wall? To meet the ranging requirements of clients, Leyard and Planar offer an array of choices of pixel pitch for LED displays and bezel sizes of LCDs. “And we offer different form factors, mechanical designs, and architectures that allow customers to get the optimal video wall solution based the needs of the installation,” Seminario said. Leyard’s Clarity Matrix G3 LCD Video Wall System incorporates adjustable wall mounts, off-board video and power, a web-based control application, and full front-service installation and service access. Two premier options in its catalog are the Leyard DirectLight X LED Video Wall System and Clarity Matrix G3 LCD Video Wall System, which each incorporate adjustable wall mounts, off-board video and power, web-based control applications, and full front-service installation and service access. NEC’s new Q Series direct-view LED panels come in pixel pitches from 7.8 to 2.8mm and are suited for uses ranging from DOOH and arenas to museums and corporate settings. In addition to its wide range of LCD video wall options, NEC recently unveiled several new lines of direct-view LED modules, notably the Q Series. Available in pixel pitches from 7.8 to 2.8mm, the Q Series features improved heat dissipation, lower power consumption, and greater contrast, and is suited for use in applications from digital signage and arenas to museums and corporate settings. Finally, consideration should be given not just to the wall itself, but what it’s capable of doing—and what it will be able to do years from now. “Consumers are used to having experiences that are tailored to their individual interests and preferences: they have smartphones, smart homes, smart cars, and smart devices that personalize activities that used to be mundane,” said Mark D’Addio, senior vice president, sales and marketing at VITEC. “As they interact with the proliferation of video displays in a venue, their expectation of a personalized experience is not going away. To make these changes easier, VITEC developed the 100-percent hardware-based EZ TV line of video wall processors to simplify the deployment and management of projects, and deliver low-latency playback of IPTV streams, even in 4K, with support for interactive content, video, and images.